Yohanes Hardian Widjonarko is an Indonesian businessman born in Semarang. He built his career with one of Indonesia’s largest timber company, PT Barito Pacific Timber Tbk, involved in massive deforestation of Borneo’s rainforest since the 1980s. In 1998, it was caught in financial difficulties at the height of the Asian economic crisis. Widjonarko resigned as its president director in June 2002 but still retained the status of a commissionaire for two years. During my reporting, I talked to many businessmen, politicians and journalists. I learned that Widjonarko, to quote one business executive, has “a lot of friends among politicians and has a good networking among businessmen.” Most of these business leaders know that Widjonarko works with Taufik Kiemas. Widjonarko regularly plays billiard with some Jakarta television executives and newspaper editors at Hotel Le Meredian in downtown Jakarta. Kawula Alit Nusantara Foundation rented an office space on the 23rd floor of Menara Mulia, one of Jakarta’s towers. “We used that office just to get together. What would people think if we sing at the State Palace?” said Muhamad S. Zulkarnaen, smiling. Zulkarnaen told me that Widjonarko is the main operator of this Washington lobby. He is also its treasurer. The foundation registered an internet domain www.kawula.or.id under Widjonarko’s name. The foundation gradually became "non active" after President Megawati Sukarnoputri lost the election in 2004. The internet domain is currently used by PT Winaros Kawula Bahari, a frozen seafood exporter, located in Beji near Pasuruan in eastern Java. The head office of this company is located in Bellagio tower in Jakarta, where Yohanes also opens a pub called Flo Lounge. Widjonarko and his wife, Lianawati Hardjoanwar (nicknamed Li Lan), also live in an apartment in Bellagio. They manage the pub themselves. Marissa Haque, a movie star who joined Megawati's party, once came to Kawula Alit office and had lunch with Taufik Kiemas and his associates. “TK’s (Taufik Kiemas) office is below the Kawula Alit headquarters. The offices are luxurious, a lot of paintings,” Haque said. I tried to interview Widjonarko many times. He didn't answer my text messages. Once he answered my call, saying he was in Geneva on his way to Amsterdam. I finally met him at Flo Lounge. He agreed to have a short interview. He said he is "a friend" to Major General Muchdi Purwopranjono, a deputy director at the State Intelligence Agency, allegedlly involved in the assasination of human rights campaigner Munir. Widjonarko admitted that he bought the mobile number "0811-900978" used by Muchdi. This number frequently appeared in the trial of the Munir assasination. 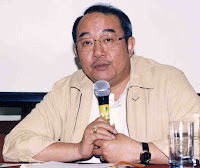 When asked how he was involved in the Washington lobby, he responded that the Kawula Alit Nusantara Foundation’s mission was simply “for orphans.” He declined to comment on his relation with Megawati dan Taufik Kiemas. "We're just friends," he said. Cold storage PT. Winaros Kawula Bahari ada di Beji, Pasuruan. Pabrik ini baru aja berdiri 1 thn (Juni 2006) dan mayoritas export ke USA. Luas pabriknya sekitar 7,000m2 dan dibangun diatas tanah seluas 2,8ha. Dengan nilai Investasi sekitar $3,300,000. Untuk ukuran pendatang di bisnis udang, Winaros ini lumayan punya mesin2 yang modern, ya siapa dulu dong yang berdiri di belakangnya. Yang handle bisnis ini semua sanak saudara Pak Hardian, mulai dari adik, kakak dan keponakan beliau. found this blog containing a brief profile of Bapak Yohanes Hardian Widjonarko, suddenly I want to post this comment. I was so lucky to be employeed by Winaros Kawula Bahari, and having chance to meet him personally. Having conversation with him several times gave me a very good picture of him. I have no enough words to describe him but a short sentence : he is the best gentleman I ever met till I write it down.